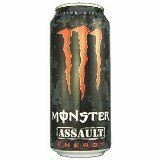 Monster Assault Energy Drink is a fruit punch flavored energy beverage from Monster Energy. It has the same energy blend as most of the other Monster Energy Drinks. This drinks sweetness in enhanced with the use of Sucralose. Although the fruit punch flavor appeals to kids, Monster Assault isn't suitable for children. 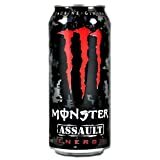 4 Pack - Monster Assault Energy Drink - 16oz. Carbonated water, sucrose, glucose, citric acid, sodium citrate, taurine, natural flavors, panax ginseng root extract, phosphoric acid, l-carnitine, caffeine, sorbic acid, caramel color, niacinamide, sucralose, sodium chloride, glucuronolactone, inositol, guarana seed extract, certified colors, pyridoxine HCL, riboflavin, maltodextrin, cyanocobalamin. 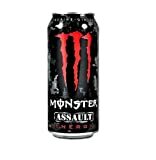 Monster Assault contains 10.00 mgs of caffeine per fluid ounce (33.81mg/100 ml).